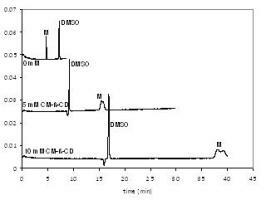 Chiral separation of optical isomers of ß-blocker Metoprolol was quantitatively investigated and modelled using un-modified and 2-O-carboxymethylated ß-Cyclodextrin as chiral selector, added to the background electrolyte. Interaction constants and complex mobilities were determined with both selectors, and as a function of temperature in the range 20-50 ºC. Interaction constants at 20 ºC were 342 and 972 respectively. Thermodynamic parameters were also determined. The chiral selectivity was both enthalpy and entropy driven. For accurately determining interaction constants, the need for ionic strength correction, and the effect of temperature and driving voltage was critically evaluated and results were compared with higher ionic strength buffers.